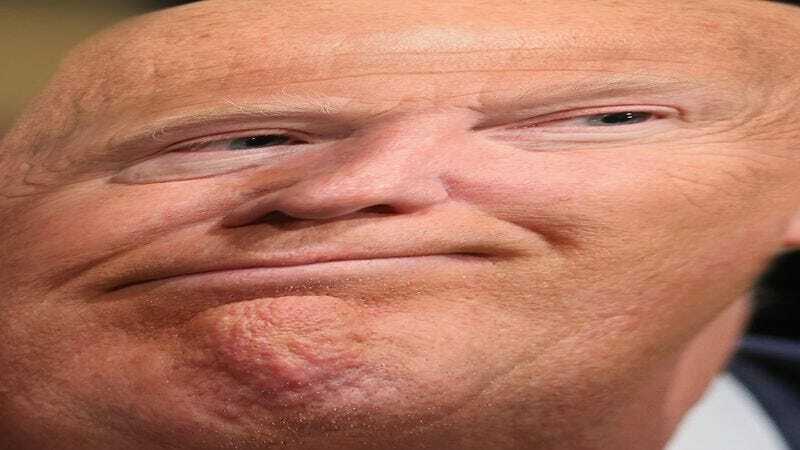 Several months ago we published a list of irreverent Photoshops depicting the then-presidential candidate Donald Trump as a bald man in several humiliating contexts. We understood that these images were a bit crass and promised to remove them if Trump were to win the election, as a sign of respect for the office of the United States presidency. True to our word, we tried to take these pictures down as soon as Trump was elected, but unfortunately we haven’t been able to figure out how to delete this article from our website. Once content is published to our homepage, it seems to be stuck there. Though we cannot delete the bald Photoshops, we have been able to stretch out Donald Trump’s face all wide so that you can’t even tell he’s the one in the pictures. We hope this serves as an adequate temporary solution until we find a way to take these unbecoming images down completely. 1. At the current time, we are comfortable posting this picture with the caption “My bald spot is absolutely yuge” alongside it, but should Trump assume the esteemed office of president in the fall, we would immediately remove it. We apologize that we weren’t able to remove this disrespectful picture of our president-elect completely, but we did what we could and stretched it out all wide. You can barely tell it’s Donald Trump. We’re talking with our programmers now to figure out a way to delete these images from the web. Hopefully they will develop a method for doing so in the near future. In the meantime, we have preserved the dignity of President-elect Trump by stretching his face out and making his eyes huge. Nobody will be able to recognize that the man in this image is our new president. 3. Of course, it would still be fine to disagree with President Trump if you don’t support his policies. A healthy democracy allows dissent and debate. However, implying that the president wears a toupee when there is no evidence that he does is a crass breach of proper decorum. The presidency is the most hallowed office in our nation, and it is worthy of reverence and decorum at all times. Ideally, this image of Donald Trump’s toupee flying off in the wind would no longer be on our website. Since this is currently impossible, we’ve used the magic of Photoshop to make his head very tall and thin. His identity is obscured. This bald man could be anybody. 4. No matter who is president, you address them as “Sir,” not “Donald the Hutt.” We would quickly remove this if the American people choose Trump on November 8. This degrading Photoshop of President Trump’s face on Jabba the Hutt’s body is immature and degrading, and we’d remove it if we could. Since we currently don’t know how, we’ve at least given him a tie to wear to imbue him with the poise and decorum the presidency confers on all who hold that hallowed office. 5. Comparing President Trump to Adolf Hitler would remain a valid political commentary, but making him bald in addition is completely uncalled for. If Donald Trump is elected, we promise to restore his normal hair to this image. Now that the American electorate has chosen Donald Trump to lead our nation, this image depicting him as a bald Adolf Hitler has become an unsubtle and tactless political statement that does not meet our exacting editorial standards. We’ve given President-elect Trump his hair back in an effort to restore his dignity. 6. For now, let us enjoy this humorous Photoshop and its accompanying caption, “I am going to build a wig, and Mexico is going to pay for it.” During a Trump presidency, it would no longer have a place in the national discourse. All right, that’s all of them. We’ve stretched out President-elect Donald Trump’s face all wide so that nobody will know that he is the bald man in this picture. Hopefully, we’ll find a way to remove these pictures from our website, but until then, this will have to do.